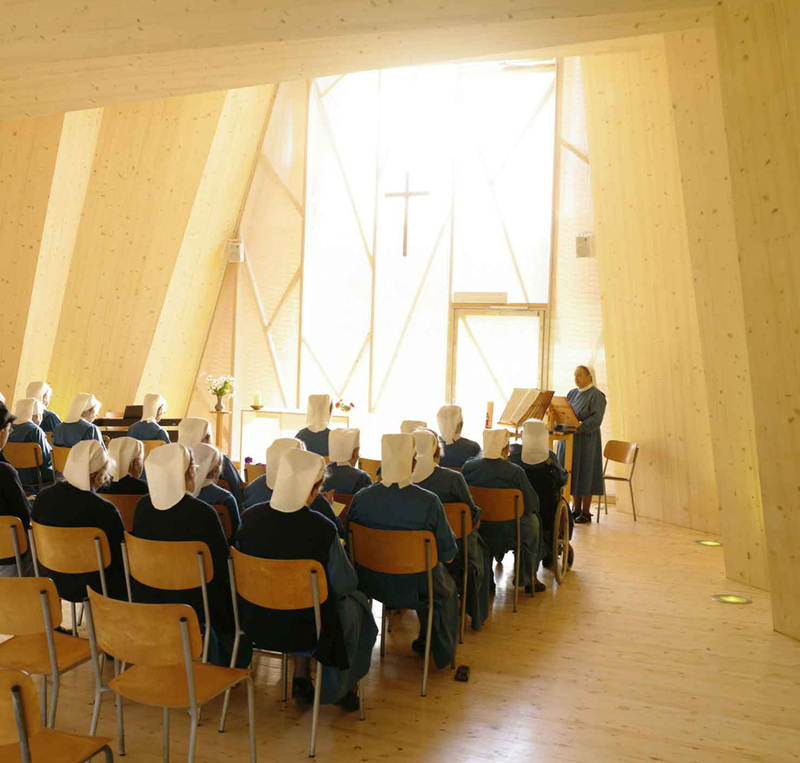 In the summer of 2007, Localarchitecture and architect Danilo Mondada were awarded the contract to renovate the mother house of the Deaconess Community of St-Loup. The commission involves the complete renovation of a historic building, including the community’s main chapel. It was immediately apparent the mother house would have to be closed for the duration of the building works, in other words for 18 months starting from the summer of 2008. Instead of settling for a standard solution, like renting a tent or containers, the architects suggested building a temporary chapel to accommodate religious worship during the construction period. Localarchitecture, which has a special interest in timber construction and new structural solutions, has made its name with several works exploring traditional and contemporary wood construction techniques. 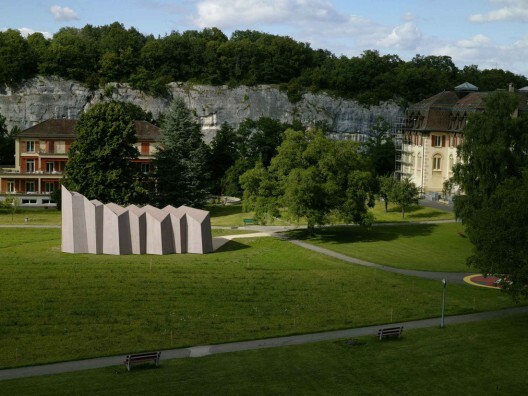 In this instance, the architects suggested working in partnership with Hani Buri and Yves Weinand from the IBOIS laboratory at the EPFL (École Polytechnique Fédérale de Lausanne), whose ongoing research into folded structures seemed particularly interesting and appropriate for this project. 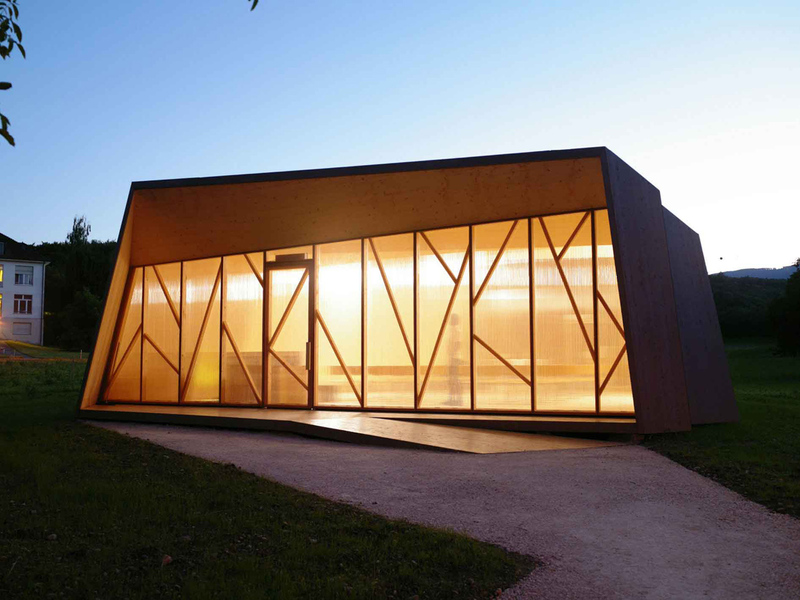 The team developed a structure using timber panels, which makes it possible to cover large areas with fine sections. The shape was generated using computer software that calculates the load-bearing structure, determines the dimensions and transmits this information to the machine that cuts out the 6-cm thick timber panels. 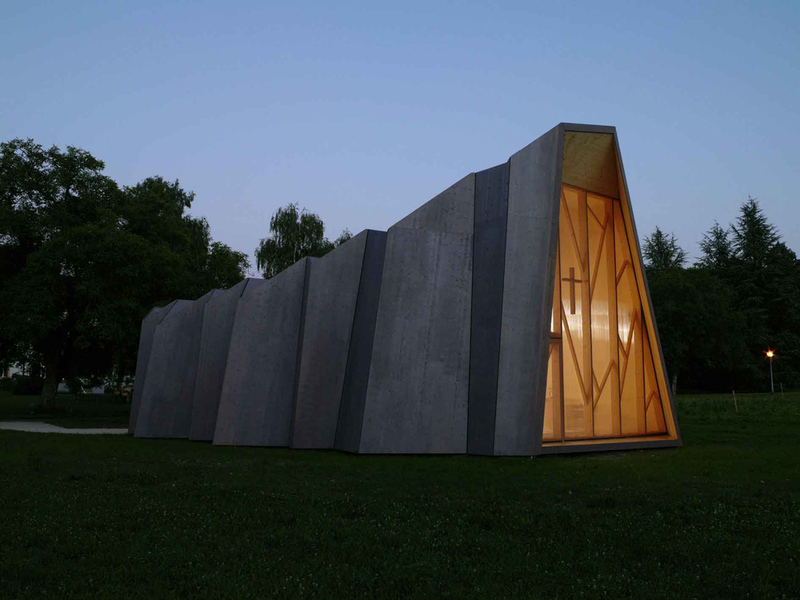 Built directly on the ground, the new chapel blends subtly and delicately with the landscape. The structure, which lies along the axis of the east-west valley and is open at each end, lets in plenty of natural light. 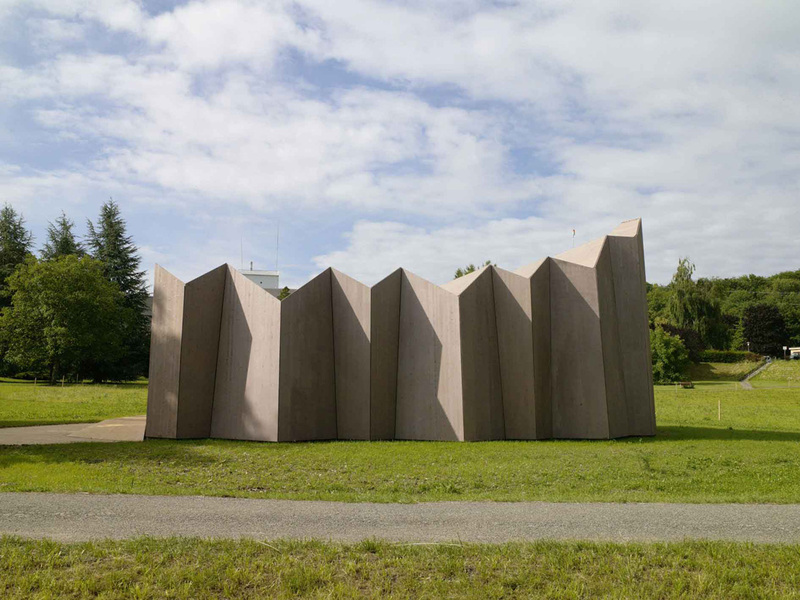 Interpreting the traditional layout of protestant churches with their variations in width and height between transept and nave, the design creates a space whose horizontal and vertical dimensions vary via a series of origami-like folds, which give rhythm to the interior and exterior of the building. The folded volume generates a wide horizontal space at the entrance, before closing in and rising up to become vertical towards the centre of the chapel. Each fold in the facade reflects the light differently and thus emphasizes the progression and elongation of the volume. The structure punctuates the interior space, while creating an atmosphere conducive to reflection. Transparent plastic panels in the gable side facades, covered with fabric, allow natural light to enter the chapel. The frame of columns and diagonals resembles the structure of a stained-glass window. 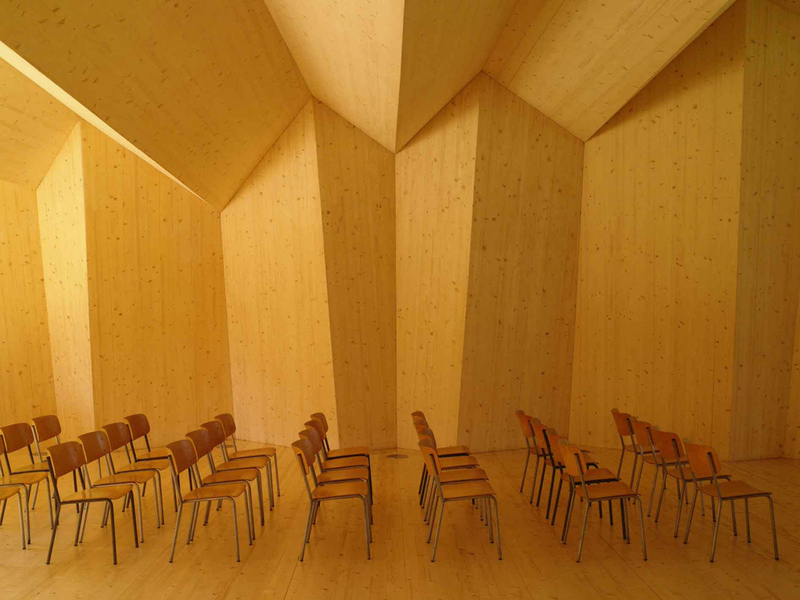 The wooden chapel in St-Loup is the first full-scale structure that incorporates design and structural analysis based on computer method of generating novel geometrical forms, but it is also a bright example of the spatial reinterpretation of a traditional religious space in harmony with its environment.